The modern life can be a sedentary one. Our whole world is geared for the comfort of sitting, from work to home, and now doctors and researchers are finding that the seated life isn’t the best life. The phrase “sitting is the new smoking” was coined a few years ago in response to the growing problem and since then study after study has backed up that saying. In fact, an article published in October 2017 in the Annals of Internal Medicine showed just how dangerous this sedentary life can be and that your before or after work exercise routine isn’t enough to combat a day of sitting. This study, based on nearly 8,000 adults, found a direct relationship between the time you spend sitting and your risk of early mortality—from any cause! The good news? People who sit for less than 30 minutes at a time have a lower risk of early death. Companies like ConSet create motorized standing desk options that are easy to use and look great in a home office. Their sleek designs means you don’t have to sacrifice aesthetics for health. Researches have learned it’s about changing your position—you can sit or stand at work, just make sure you are switching between the two every half hour and breaking up the day with small walks. As this information has become available, more and more office furniture companies have changed their desks and chairs to help combat the scary statistics. For many people, especially here in Southwest Florida, their home office is their main business area but they don’t often think about making this a healthy space in their home. There are so many great desk options on the market so it would be hard to find one that didn’t work for your specific needs and home office space. 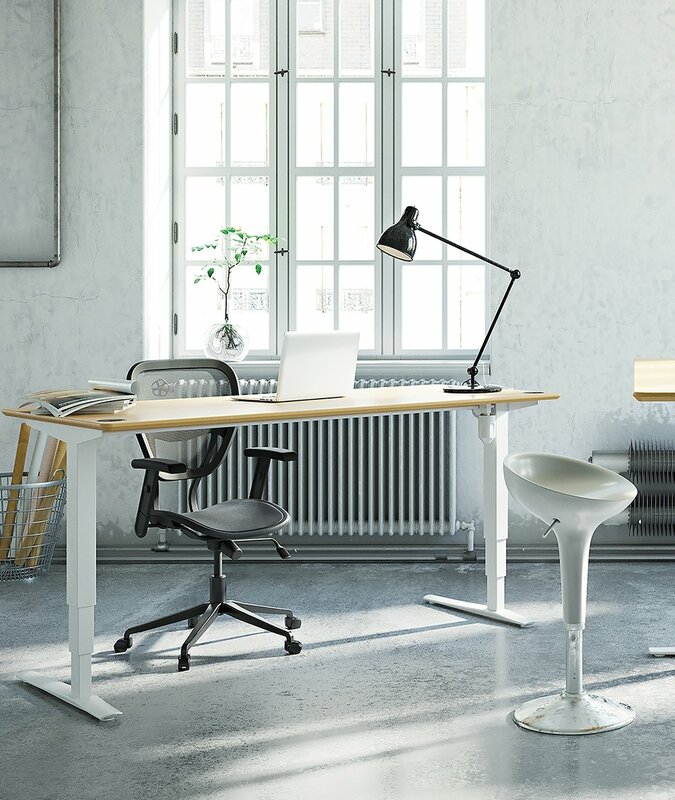 At our OFEX showroom we offer everything from small standing desks you place on top of your existing desk to electronic options that can be lowered and raised with the push of a button—there is a healthy option for everyone. For electronic standing desks, Open Plan Systems makes a high-quality product with a sleek, minimal profile. Their LED Smart Keypad system can be programed to four different height positions so you can save your favorite height preferences. They also have an app you can use to track your office habits and to remind you to stand at certain times of the day. A U.S. based company, their products are backed by a lifetime warranty. Neutral Posture offers seating systems with pressure-reducing contours and custom-fitting adjustments. Combine 9 is another company that makes standing desks but their products have a modern industrial vibe with reclaimed wood and the look of steel beams. Considering the popular trend towards reclaimed woods and vintage sensibilities, these desks are in high demand. They also signal a trend toward a more “fashionable” standing desk. Just like you shouldn’t sit all day long, you shouldn’t stand either. Standing for hours at a time can put unnecessary stress on your back and joints so a good standing desk needs a good chair. Companies like Neutral Posture offer seating systems with pressure-reducing contours and custom-fit adjustments. Developed by Dr. Jerome Congleton through his ground-breaking research on a seating system that would support the neutral body posture, Neutral Posture chairs promote the optimum position for great circulation even in a seated position. Normal chairs create pressure points in the pelvis and its surrounding areas which radiates up into the lower back, constricting blood flow and pushing against nerves creating that stiff, painful feeling most people experience when they try to stand after a day in their chair. The ergonomic design drastically reduces that pressure allowing for better blood flow and fewer pinched nerves. A healthy home office is an important part of your mental and physical health. By incorporating a mix of standing and sitting throughout the day and by using furniture that helps you stand longer and sit smarter, you’re well on your way to a better workday and a longer, fuller life. With over 30 years of experience in the office furniture business, Office Furniture Exchange specializes in all your office furniture needs. From budget-friendly to high-end, we are able to provide you the personalized attention and advice as you look for an office furniture solution.